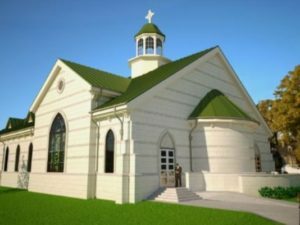 Memphis Theological Seminary will break ground Thursday on the freestanding Hamilton Chapel as the institution continues its eastward expansion. The 300-seat facility is made possible by a $3 million gift from the late Dr. Ralph Hamilton and his wife Barbara to the Midtown institution headquartered in a historic mansion at the corner of E. Parkway and Union. Total cost of the chapel project will be nearly $4 million, seminary president Jay Earheart-Brown said. Hamilton Chapel will rise at the southwest corner of Union and St. Agnes, a block east of the main seminary building. Six small, brick houses now line Union between St. Agnes and the main seminary building. The school has purchased all but one the houses — the second one from the main building — and will remove them as part of a major expansion of the campus footprint, Earheart-Brown said. The seminary has acquired other nearby properties in pursuing its long-term plan to develop an expanded campus footprint from the current three acres to 14 acres eventually, he said. The chapel will house a number of activities, including the seminary’s weekly chapel services. That function is now held in the converted ballroom of the Beaux Arts mansion. The building also will be used for such public events as lectures, concerts, community organization meetings and other events, he said. Hamilton Chapel will house donated art works and a 1924 M.P. Moller organ acquired from the former Union Avenue United Methodist Church. The organ, valued at $550,000, is similar to other Moller organs at Camp David and the Lincoln Center in New York City, according to seminary officials. The seminary is an ecumenical graduate school of theology. The institution was founded 165 years ago in McKenzie, Tennessee, and moved to Memphis in 1964. The groundbreaking ceremony was held Thursday September 28th.